As I’ve mentioned before, I NEED MORE PRACTICE~ and so here I am trying to polish my nail art skill with more nail polishes…lol…hmm…did you get the joke?? Okay, as you can see from the above picture, after doing the chubby Santa on my thumb nail, I decided to continue with another 2 more nails using different colours. Why not all 5 nails you may ask? In order to have more practices, I’ve decided to use the nail wheel so that I can do other stuff while waiting for the polish to dry. Inspired by the Chubby Santa design, the basic idea is to have the inner shirt, the outer coat and the belt therefore I’ve painted the inner shirt and the outer coat for all the 18 nails using different colours. 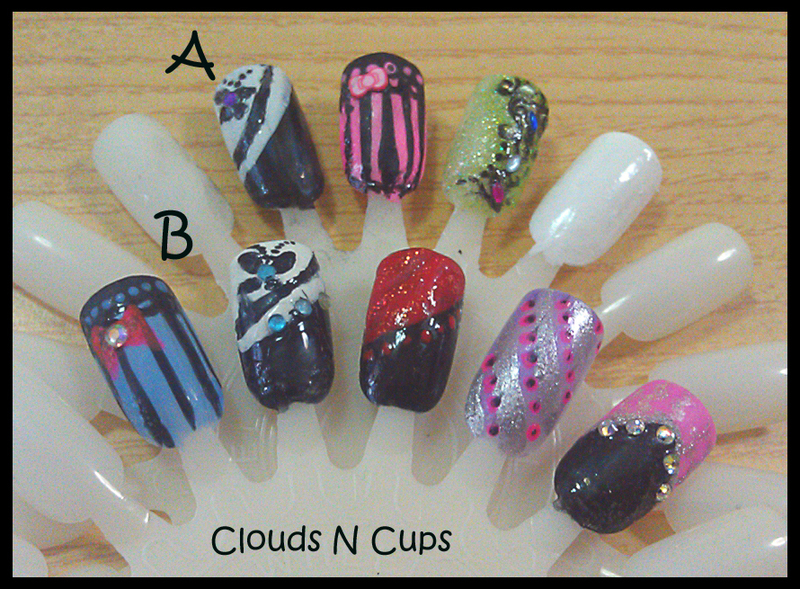 I will then enhance the designs as accordingly using other polish colours or nail art decors. A belt (with different design) will be added in order to keep the style in this wheel uniform. 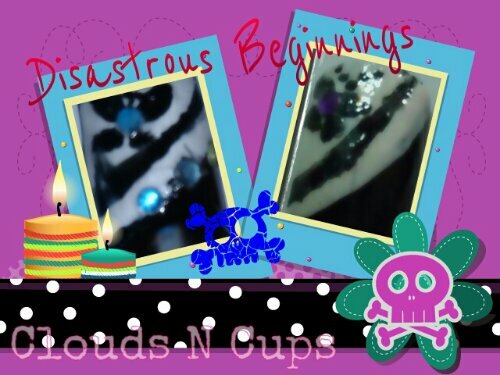 From the above picture, you can see that I’ve already done 2 nails with the white inner shirt and pink & blue glitter outer coats. The white polish surface is still very cakey but I decided to finish using it before buying new one. 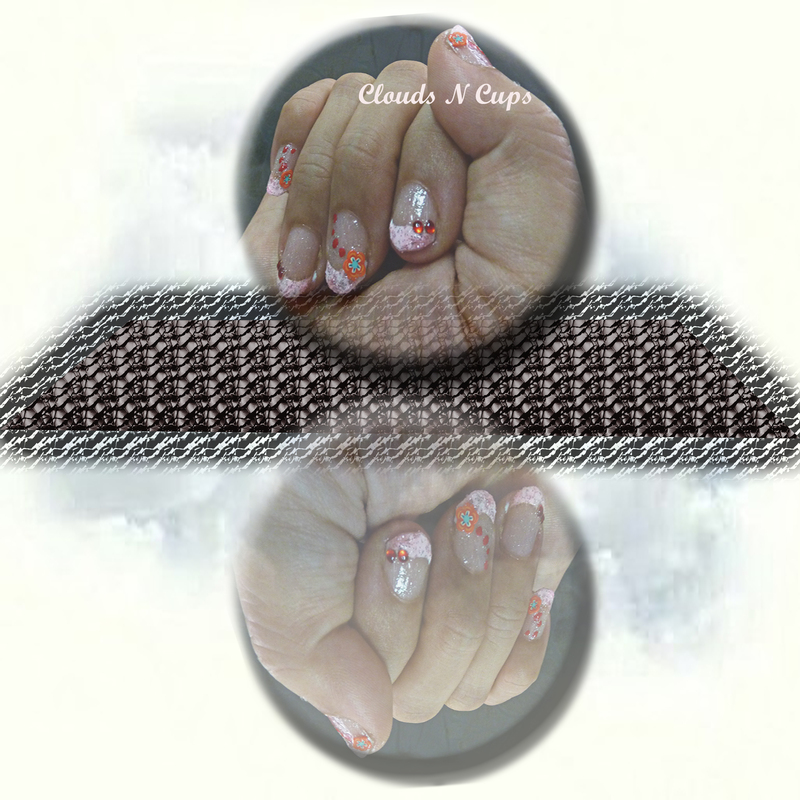 For the first design, I’ve used the pink glitter polish as the outer coat. I have used the golden micro bead as the gold buttons of the shirt and our clear colour 3D acrylic ribbon nail art decor as the big belt buckle. 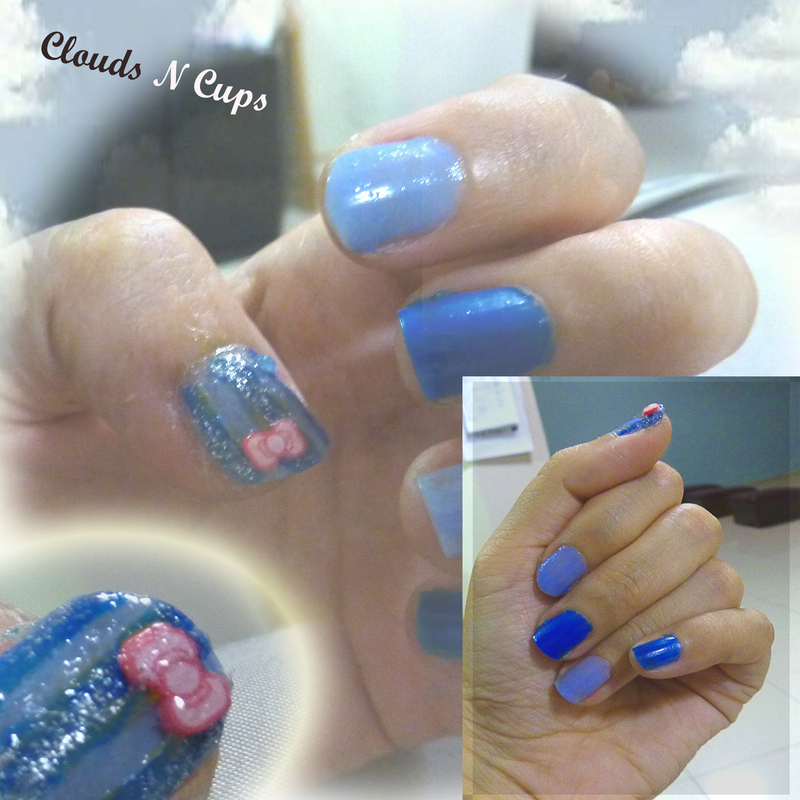 For the second design, you can see that the blue glitter outer coat is a longer one. I’ve outlined the side of the coat with another blue nail polish. At the top part, we’ve used our rounded green rhinestones (dark green for the core and light green for the petals) as the flower pendant of a choker. The belt is a 2-colour belt slanting down to the side of the hip but I am not too satisfied with the belt because the buckle is not very visible (shall improve in this). And so this conclude Part 1 of my Nail Art Practising, Santa Style. Are you able to figure who is doing A and who is doing B? Do make a quick guess by leaving us a comment in this post just for fun sake…okie?? Oh, I’ve received another comment from katie1094 telling me that she is playing Minecraft as well…cool!!! Now we’ve another nail art lover who plays this game and I am so happy to know that I am not alone here. 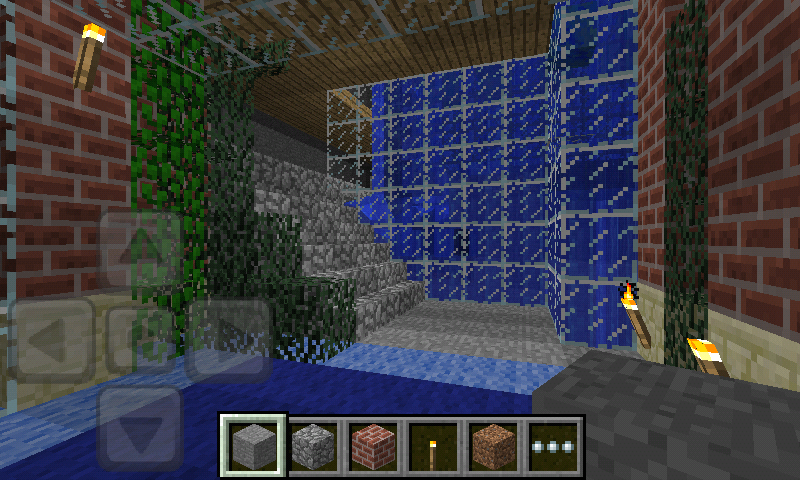 Currently, I am working on ‘My First World’ and I’ve succeeded in creating tunnels under the sea (Yeah~). Last but not least, may you all enjoy reading this post. Till then do continue to be with us, okie? 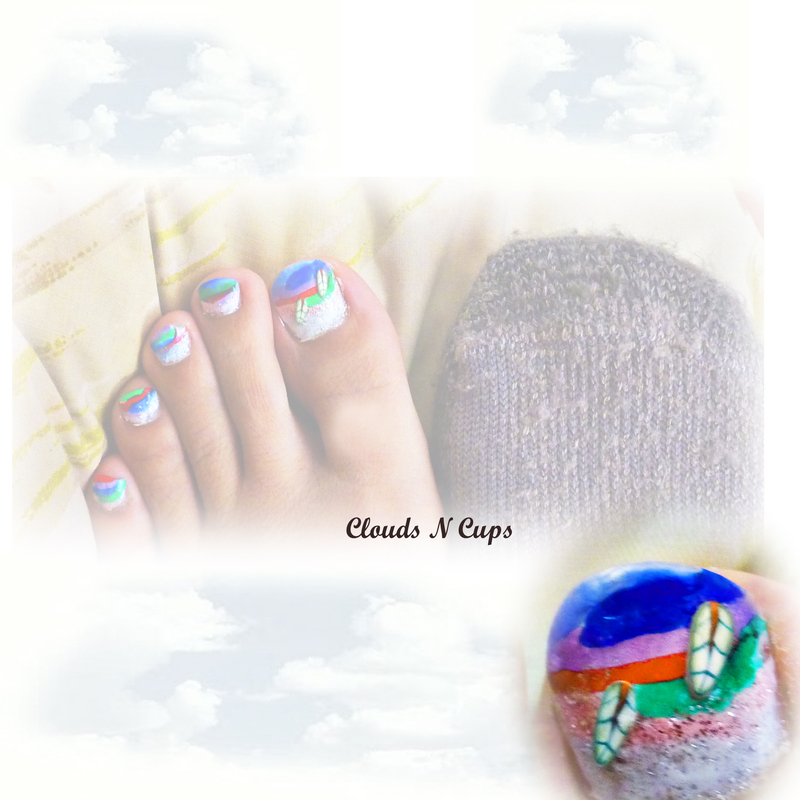 I don’t really understand the language of this blog but I am attracted to the nail art of these minions. They are so cute and they reminded me of a video I once watched in YouTube. Laats zag ik de film Despicable me weer eens. Ik vind dit echt een grappige film en die gele poppetjes (minions) zijn zo schattig! Daarom leek me het leuk om deze een keer op mijn nagels te maken. Kijken jullie mee hoe ik dit gedaan heb? As a name, what do you think about ‘Childish Smile’? 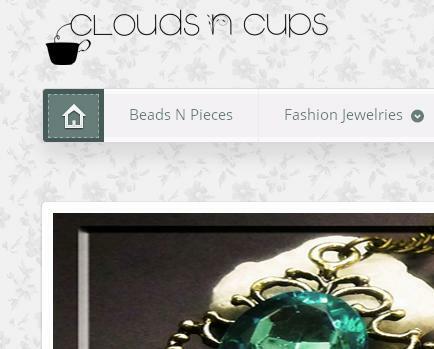 Received a comment from CreatingADream for our “Look! 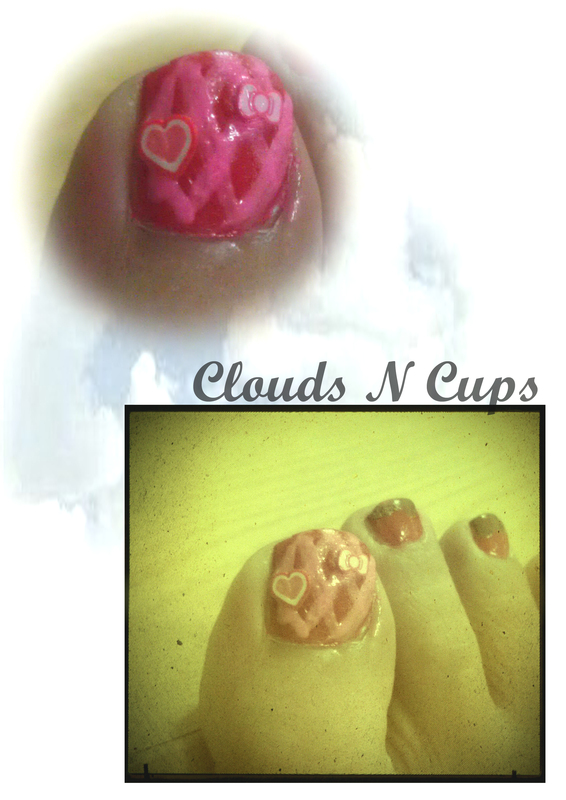 Pinky is Blushing” post and decided to do a nail art using red and pink. The system of my mobile phone was recently updated and I noticed there are some new features in the default camera app. So I took the photo using it and the result is quite satisfying. The bottom picture was the result after using its effect mode. I’ve used a ribbon fimo and a love fimo to represent a female at two different stages of her life. The ribbon fimo represents a little girl’s smile, which is by default, a childish sweet smile. The love fimo represents a lady’s smile whenever she felt being loved, a sweet and perhaps a little childish smile? The above are just purely my own interpretation inspired by the given name. Oh Gosh..oh gosh….I’ve had a difficult time trying to upload this post because the ‘add media’ button is not working, I wonder what is going on??? Thank God I managed to upload picture using another add post option, but I don’t really like it because this option does not have a preview button….sob*sob*…. Okay, back to today’s topic…This post title immediately came into my head the moment I finished the design and had an image of two feathers coming from a bird flying over the rainbow…hehehe…. If I were to take down photos of myself trying all kinds of funny postures just to paint the nails, you may think that I am doing some difficult yoga postures rather than nail painting? Blue is one of my favourite colours and thus I decided to try out two blue colours on my nails. Unfortunately, besides painting my nails blue (x3), my mood was painted blue as well. It was the day I FINALLY realised why those previous few nail designs were getting small lumps after applying the top coat polish. Did you see the ‘x3’? Yes, it took me 3 tries….why? BECAUSE MY TOP COAT WAS CONTAMINATED!!!!! Sad…now, I’ve no more usable top coat polish BUT I am just tooooooooo lazy to go and get one. Must get one soon….must get one soon…..
Can you notice the uneven surface? Trust me, that was the best I could with THE CONTAMINATED TOP COAT..(*sob*sob*). No top coat polish applied to the other 4 nails since I was convinced that they looked nicer without it. By the way, did you also notice two tiny round blobs? They used to be two sparkling light blue 2mm rhinestones but after 3 tries, they became two blobs (*sob*sob*)….poor rhinestones…don’t be sad…you still rock, even as a blob!!! Perhaps it is just me, LOL. Nevertheless, I’ve only managed to apply my design on the big toe while the rest, I just finished them off with 3 light purple dots on each nail (may not be very visible in the picture) in order to match the purple flower fimo. As a matter of fact, I wanted to use a blue flower fimo but then the contrast between the fimo colour and the background colour will be very low. What do you all see? No harm letting me know eh? The upper picture was taken while my feet were still dry. When I was changing water for my red face turtle (of 23 years), water was running down my feet and when I look at the nails again, they looked kinda…hmmm…different? So I decided to take down another picture for comparsion purpose. Hope you are enjoy this humble design of yours truly. Colours used: White, red, sliver glitter and pink glitter. Gotta get back to more fimo cutting and sorting.